Perhaps the base Tesla Model 3 will come in five or six months? Tesla CEO Elon Musk says he’s not the most punctual individual. He explains that he’s dumb at predicting dates, but that surely doesn’t make him dishonest. Musk is one of very few CEOs that regularly “talks” to the public via social media. He has no problem speaking his mind and sometimes types things that he may later regret. Some would argue that Musk is too honest, though they may appreciate that he’s so open and real. Others call him a liar and claim that his Twitter “mistakes” are calculated. Nonetheless, in his recent interview with 60 Minutes, Musk offered a new guess about the launch date of the $35,000 Model 3. People have been waiting for years for the base Model 3. There have been plenty of guesses concerning its arrival, but the car’s launch date keeps getting pushed back further. Some people even believe the car will never come. Still, Musk has continued to assure that it’s coming, but “when?” is the question. The CEO has made it clear that Tesla must be in a position of profitability in order to successfully launch the least-expensive Model 3 variant without facing dire financial consequences. Tesla finally showed a profit last quarter, and the automaker has been selling a slew of more expensive models to get to a point that profitability is consistent. Of course, in the recent 60 Minutes interview, Lesley Stahl brought up the $35,000 Model 3 topic. Musk said he believes it will be available in five or six months. The company’s goal is to get it out in less than six months, but again, Musk makes it clear that this is just a guess and admits that predicting is clearly not something he’s good at. He says that the car itself has to be profitable before Tesla can ship it. While he doesn’t come right out and say it, this likely means that today the base Model 3 would still sell at a loss. Musk also shares his opinion that a failure to meet these deadlines should not be construed as him trying to mislead people. We should also point out that Musk is currently on Twitter complaining about the way 60 Minutes edited his recent interview. With hours of footage to work with, the 14-minute segment doesn’t paint the whole picture. He even goes so far as to say that the publication should release the entire transcript so that his words aren’t taken out of context. So, it’s hard to know exactly what was said in the interview regarding the $35,000 Model 3, as well as all other topics. You’re right. There was a ton of footage with many people at Tesla that would be great to share. Longer pieces like we did with @MKBHD tell a more interesting story. We hope to have the opportunity to publish an article by Musk someday, and we’d love to provide our readers with an unedited interview with the CEO in the near future. Fingers crossed! 110 Comments on "Musk Struggles With Predictions: Offers New $35K Model 3 Launch Guess"
I’m sure it has nothing to do with the fact that it’s a five year old car with over 100k miles. “Used Tesla prices have dropped 31% at Carmax as inventory swells”. I’m sorry, but depreciating by less than 40% ($50k still over 60% of original $81k price) is incredibly good for a used car! This car has held its value very well. That flies in the face of the headline. It is more sensible to buy a used car. So total cost of ownership $1/mile even with free everything else and 0% interest. Tesla S is not in the same space at F150 or Landcruiser. Check https://usedfirst.com/cars/bmw/5-series/ or similar cars. Who wants an out of warranty Tesla? If you get one, you just pray nothing major breaks. Out of warranty premium priced ICE vehicles can be had for dirt cheap, for that very reason… It’s not just the drivetrain that’s the issue either, it’s the parts and repair costs for everything from suspension (especially if it’s got air suspension) to electronics. tesla warranty is less than 3 year? 4 on the vehicle and 8 on the battery? • Model S and Model X – 8 years (with the exception of the original 60 kWh battery manufactured before 2015, which is covered for a period of 8 years or 125,000 miles, whichever comes first). • Model 3 with Standard or Mid-Range Battery – 8 years or 100,000 miles, whichever comes first, with minimum 70% retention of Battery capacity over the warranty period. • Model 3 with Long-Range Battery – 8 years or 120,000 miles, whichever comes first, with minimum 70% retention of Battery capacity over the warranty period. Stating the obvious, but the loss of battery capacity is a large negative for EVs generally. I assume Teslas generally do not degrade enough to have a warranty claim on the battery. I’m throwing a wild guess here, but I think it wouldn’t be surprising to see Tesla batteries hitting 500k miles and still not reaching 80 percent capacity retention. Just going by the overall trend charts I’ve seen so far. And by then – lets say 10 years for some avid interstate traveler – I wonder how much a battery replacement would cost if their prices keep dropping rapidly like this. That looks like normal deprecation for most cars. So quite above average resale value. Oh look, a used car dropped significantly in value by sitting on a lot for 3 years. Imagine my lack of surprise. But citing cherry-picked examples to support anti-Tesla pravduh doesn’t prove anything… except that you’re a Tesla basher. Tesla already has a $35,000 car. People who buy a Model 3 get a sticker price of $35,000 plus any options. Tesla will start offering the same car but with shorter range, a tad less acceleration and without the premium upgrades. The price of used Teslas is doing remarkably well even though everyone knows what’s coming. What will change is that tax incentives will go away and prices of used cars will go up. Right now, a car loses over $10,000 as soon as it’s driven off a lot in California. When that’s no longer happening, people will expect a much smaller drop. Yeah, the idea that prices for used Tesla cars will drop significantly when Tesla finally starts selling the base $35k Model 3, is pretty absurd. 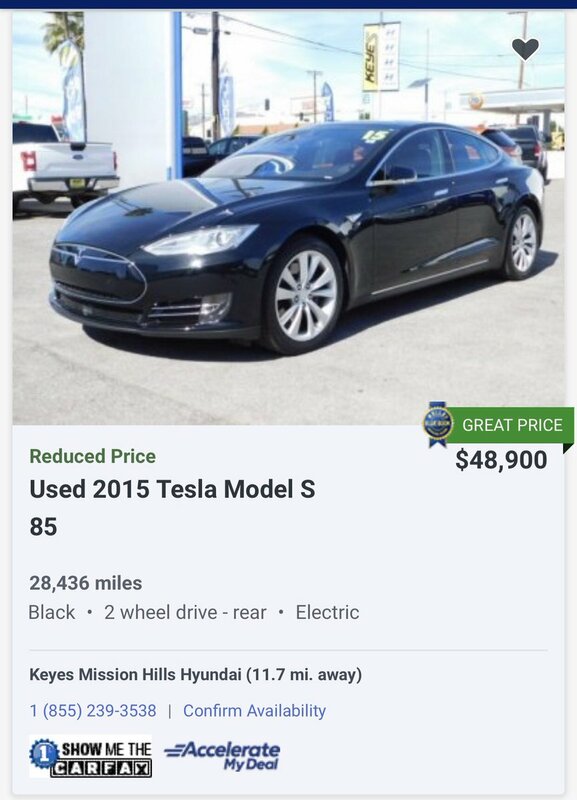 Did prices on used Teslas drop when Tesla made that special offer for the electronically limited S75 and X75 sold as the “S60” and “X60”? Nope. Until Tesla actually offers that model for sale, it doesn’t. And that’s quite aside from scummy business practices like continually letting people with paid deposits form years ago be queue-jumped by people willing to pay for a more expensive car (something which was never mentioned when taking said deposits), requiring all buyers to buy the (3x over priced “premium” interior upgrade, and price gouging on the color options. Requiring a surcharge for any color except one is unheard of in anything except the cheapest eco-cars, and certainly not having black be that color — a color which studies show is unsafe due to visibility issues. To the b!tchers about the promise of the $35k Model 3: Tesla has to worry about their survival first and your desire to have a low cost Tesla second. It ain’t personal, and no one’s been duped. It’s simply about survival. The margins on a less expensive product are less than a more expensive model, it’s simple math. As soon as Tesla is able to flood the masses with less expensive cars, they will do so. Economy of scale. Now, get your ‘thumbs down’ fingers warmed up and lemmee have it! I think this is more of a case that Elon hyped 35k then figured out its not really doable. Looks kind of foolish. Can’t really say it’s not doable until he concedes that it’s not gonna happen. While the timeline is arguable, the fact that it won’t happen has yet to be determined. I didn’t thumbs down, because you have a couple valid points. My post was only an opinion that Tesla was overly optimistic at the 35k price point. Nope you suggested that Elon has figured out that $35K is not doable and that he looks rather foolish as a result but it turns out it actually just your own unsubstantiated opinion. Rather foolish…. He isn’t saying it isn’t doable. All he is saying is it would take more time. Normally, Tesla could have simply released it at a slight loss and wait it out as they get their margins up. But now that the credit market is hard to work with and investors demanding profitability. Tesla can’t do what it usually did and has to delay it further. But a few months delay isn’t the end of the world as some make it out to be. At this rate, Ford’s vaporware Model E may come out before the base Model 3. What’s good for the goose etc.. So let’s not hold Mary B. to her promise of 20 evs in 4 years and 2 coming in 6 months. He said it would be there soon after launch? When did Elon say that? Even at the reveal, watch him when he announces the launch date. He’s clearly conveying that end of 2017 is far from certain for first deliveries, and the audience chuckles at his lack of confidence. Tesla even has a history of not selling the cheapest versions right away. From August-October 2017 Tesla’s official web site said 35k version would be available in November. Before they hit 5000/week. Before AWD. Before P.
I understand why they changed course, but let’s stop pretending they never promised 35k in 2017. What “promise”, there never were any promises just targets. When Tesla failed to ramp up significantly in 2017 it was obvious it wouldn’t be able to deliver a $35K version in 2017. It will come though, Tesla has great plans in terms of volume and those are not going to happen if the price point isn’t right. You (and other serial Tesla bashers) keep calling a goal a “promise”, because it fits your anti-Tesla narrative. Elon said what he actually believed at the time Tesla was gearing up to produce the Model 3: That Tesla could sell a base $35k Model 3 at a profit. But Elon’s belief was based on some false premises: that he could entirely automate the assembly line and speed it up to have robots working at eye-blurring speed, significantly increasing throughput beyond what any auto assembly plant had ever achieved. This turned out to be much too optimistic; human assembly is required (or at least far more practical) for some steps. As a result, the unit cost of assembling a Model 3 is higher than planned. Despite this, Elon is sticking to his promise of a $35k Model 3, as soon as Tesla can sell it profitably at that price. But of course, the serial Tesla bashers give Elon no credit at all for being steadfast to his promise; instead, they castigate him because it’s going to take longer than planned. You can hold the CEO accountable all you want. The CEO has more information this week than he does the week prior. And so on. Things change. Material costs change constantly. POTUS changes. The economy changes. Do you see a trend? Having a perfect crystal ball amid the countless myriad whack-a-mole problems/challenges/situations is impossible. Tesla and Elon do the best they can do to predict where they will and want to be, you act like it’s so simple and easy. So you either be a little more patient, or don’t and go buy a Bolt instead. We all have choices to make. What kills me is folks like you think that Elon can simply wave his wand and give you what you want right now, he just simply chooses not to. And let’s be honest bro1999, you don’t actually truly want to see Tesla successfully release a $35k Model 3 any time soon. Because that would mean success for Tesla. And I never see you on the successful Tesla articles, you only show up at the ones with wiggle room to sling arrows at Tesla. I’ve noticed your trend. Tell me I’m wrong. And I’ll tell you that you’re in denial. Tesla is a Premium Maker like Mercedes, BMW and Audi and have shown $35,000 is about as low as they can go. I would like to see Tesla design a sub-$20,000 family sedan based on the model 3 and perhaps subcontract the build to a company like Majna, that builds the I-Pace for Jaguar… Ford or FCV?…or, how about a subcontract to GM to keep the midwest factories operating? So far they’ve shown 46k is about as low as they can go. Were you raised in a country without a capitalist economy? You don’t seem to understand the concept of competition. Tesla doesn’t want to support GM’s factories. It would like GM to sell off some of its factories, so Tesla can snap them up at fire-sale prices, as it did with the former NUMMI plant… now the Tesla Fremont assembly plant. Such an electric vehicle is quite far in the future if it ever happens without credits/rebates; you can buy a used EV or a new Corolla, Elantra, etc, etc. gasmobile today. Actually, with Dealer discount, Nissan USA $, tax credit and Calif. rebate a Leaf is there or close today (before the sales tax on the pre credit/rebate price anyway). We don’t know Mr. Musk’s intentions. He is an optimist and the world needs some of those. The problem I have, is that there are people waiting with their gas guzzlers, not buying an EV now, because they hoped for a 35k Tesla. I remember conversations with people back in late 2016, where people said they were waiting for a 200+ mile EV, but the Tesla seems better value for money, compared to the Bolt, so they’ll want to wait a little longer. I guess some of those people are still waiting, driving their gas cars for 2 years and will continue to do so for 5-6 Musk months. And to not get me wrong here, Tesla has done very good things for EV adoption, but at the end of the day, it’s not really the mission for sustainable transport, but rather being a successful company. And that’s fine! But at least be honest about it. Because if people back then would have known that they might have to wait another 2-3 years, they might have leased another EV instead. There’s no way Tesla won’t deliver some $35,000 Model 3s. They would lose way too much credit if they didn’t. But I wouldn’t be surprised if, when they make the standard range version available for order again, the new starting price is going to be a couple of thousand dollars higher. But even a $35,000 model 3 is not really an “affordable electric car”. Yes, it’s in the neighborhood of the avg. sales price in the US, but that’s for all vehicles. The avg. sales price for a sedan is $27,000. And looking at the trade-in data for the Model 3, I got the sneaking suspicion that some of those people are taking on irresponsible long 7 or 8 year loans to be able to afford the car. And yes I understand that’s on them, not Tesla. They have already made the same mistake on the Semi. Well, at least Tesla did cite prices for the Semi Truck as “estimated”, so there’s some wiggle room there. What I see as the real barrier to Tesla’s economic plan for its Semi Trucks is promising the Megachargers can deliver electricity at 7¢ per kWh. Give utilities’ price structuring on demand charges, I don’t see how Tesla can make that work for them if averaging prices out across the U.S. Hoping Tesla can pull a rabbit out of the hat, but this may be another case of Elon using unrealistic assumptions. They will have warp drive powered generators out of site under the megachargers. Yes $.07/kwh electricity, if available at all will be at 3 AM at a moderate charge rate or maybe in Newfoundland where they have surplus hydro power. If you plan to keep the car for a decade or longer why is a 7-8 year loan irresponsible? The only irresponsible thing I could think of is not carrying gap insurance on such a purchase. Gap insurance won’t help you when you see a reduction in income, and can’t afford to pay off the loan anymore. It also adds cost. You very likely also pay more interest. You also will have to pay for either extended warranties, or repair costs, or both. All while you’re still paying off the car. A lot of people just take these loans because they are suggested to them by the dealerships. But if you have the time to do some research, and are somewhat flexible, then there are a lot of deals out there. EVs are a great example of course. Because OEMs need to sell them, you can get a lot of cash off the already unprofitable MSRP. I dunno if it’s proper to call it “irresponsible”, but the amount of interest you’d pay on a 7-8 year loan is absurd, and the overall cost will be much higher than for a 3-year loan. Saddling yourself with that kind of debt may or may not be irresponsible, but it certainly is foolish. Nope, that’s the average vehicle which includes large SUV’s and Trucks. The average transaction price for a mid size car (the Model 3 is a mid size) was $25,865 in January 2018, in your very link. Sure, you could claim it’s an entry level luxury car, and that it’s around the mark for that ($42,484), but then a luxury car is not generally considered affordable. I don’t remember where I got the $27,000 number, it might even have been KBB. If you look at the data and keep in mind an awful lot more midsize sedans were being sold than the more expensive luxury or performance sedans, than the weighted average is going to be around $27,000. The compact and subcompact car sales will also put some downward pressure on the avg transition price. New Camrys can be bought in the low $20s. Is that with, or without a Camry Dent? Also, sure, you can buy a new Camry for $20k, but, well, let’s be honest, the Camry is a boringmobile. Has Tesla ever used the term “affordable car” in describing the TM3? So far as I know, that’s only the mistaken label applied by reporters and journalists. $35,000 is much too expensive to be a truly “affordable” car. At best it’s semi-affordable. A truly “Everyman” EV needs to be priced at $27,500 or under. Tesla most certainly has used the term “affordable”. Specifically, Musk. As far back as 2006 and then again in 2016, in elaborating the basic Tesla strategy (“secret master plan”). A very reasonable & rational strategy… Except that they aren’t quite managing to follow it. So, when can we say that the $35k car is vapourware? Until it comes out. Or at least that is how long we will have to listen to that. Yep, troll food until it is actually delivered, like all Tesla products ever so far. Let’s precise that we’re talking about a 220+ miles range $35K car. From Tesla, yes, it still is vaporware for few more months. Meanwhile, the Bolt EV has been available at this price for 3 model-years now. No, it’s not “vaporware”. Look up the definition. A product merely being delayed doesn’t make it vaporware. 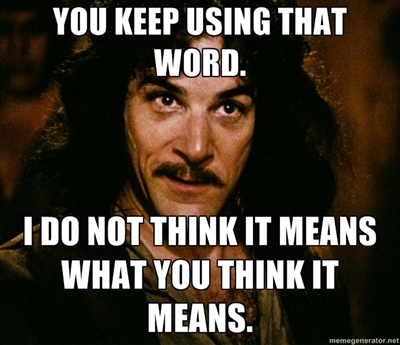 Of course, if you redefine words to suit yourself. July 1st, 2019 is the earliest that deliveries of the $35k version will begin in the US, IMO, and it’s quite obvious why. In fact, maybe only the $40k version (SR+premium) will be to begin then. Tesla has gobs of worldwide demand to fill with the MR/LR/AWD, and the $40k version will give a huge boost in US demand. A true $35k offering probably isn’t needed to sustain sales until 2020, but Tesla will probably offer it to early reservation holders sooner than that. I personally think the $40k version is the biggest milestone we should be watching for. I think Tesla would save a lot of face if they offered every US reservation holder waiting for the $35k base that reserved before… say… 4/30/2016 the opportunity to order one when Tesla is able to offer the $40k SR+PUP. They do all of these base SR on one of the 3 production lines and could use the production run as a learning experience to iron out production inefficiencies in the SR Base config. Then once they have SR profitability worked out they can open up the flood gates…. They will run out of long range/performance Model 3 orders eventually, it’s not like they have full control over what kind of Model 3 people want to order. Elon in his letter to employee said, they are currently at a price price. Of 38500 dollars for Tesla model 3 in my opinion Elon Musk should released the base model 3 for $ 38,500 right now and later reduce the price to $35000 when they are able to. Profitable $35K poverty edition: Halogen reflector headlights, black color only and steel wheels. LED headlights available in $10K option package. AC/Heater usage fee $1/minute. Software update fee $200. Last in the line at service center. Destination/Doc fee $2000. > AC/Heater usage fee $1/minute. Honey, why is it so cold in the car. If Musk consistently getting deadlines dead wrong was due to incompetence rather than deliberate hyping, that would be even more worrying. It also leaves utterly unexplained why his “guesses” are always in the same direction, why it always takes much longer to achieve things than he predicts. On the alternative theory, that he is hyping it, there’s no mystery to explain. At this point I reckon there isn’t really any doubt left to give Musk the benefit of. He is a clever man, but his ethics are no better than traditional snake-oil salesmen. Too many personal insults, Pi-Pi. Surely you are worthy of more constructive dialog. I agree with you QCO, too many personal insults from Pushmi in this comments section. > Turns out those specialist were right. That certainly depends on your perspective. If the car is released at that price of $35,000 next July, then they are wrong. And about Elon’s predictions, he has already stated, that he is bad at them, and he has also made quite clear, that people should not see that as trying to mislead people. People have the option, of not buying the stock, not buying his cars, and so and so on, if they are so offended, by him not meeting his predictions. Getting back to that $35,000 price. Really, it would be a major issue, if they were not selling any cars, but they cannot even come close to meeting demand above that price. Of course, any smart person, would sell the high valued products first before trying to meet demand at a lower price point. That just basic good business practice. What did matter back then was the story to sell in order to raise billions, the story was good, he got the billions. Result achieved. The rest nobody really cares. It is like this merger with that failed solar panel company. The rotten assets bought at an exorbitant price are slowly being depreciated or written off in Tesla balance sheet. Thing is nobody remembers anyway. Its a gamble basically, if you win nobody cares if you sold your grandmother on the slave market to reach your goal. Then have nothing to do with Tesla. No one is forcing you, or anyone to buy their stock, or cars. That’s how the market decides whether a company has a product worth buying or not, and funny thing is, Telsa cannot even meet demand at a price way above $35,000. You whole argument falls flat on that, and especially when the $35,000 car will be released. Elon has never given a timeline on the release of the car at that specific price, only saying, they would. > nobody cares if you sold your grandmother on the slave market to reach your goal. Of course people would care. It’s absurd hyperbole on your part. Your long-term “short” investment in Tesla certainly was a gamble, one that presumably lost you a lot of money. If you actually bought into your own repeated lies about Tesla, all your pravduh and FÜD over the past few years, then you have no one to blame but yourself. It’s sad when someone starts believing his own lies. Tesla won. You anti-Tesla FÜDsters lost, every one of you. Get over it, and find a better investment for your money. How much more amazing that they can sell 4-5k/week at $46k and above in limited markets with no leasing? What a runaway smash hit. Now let’s imagine for a second what would have happened if Elon Musk wasn’t in charge of Tesla. Tesla is the only American auto maker which has managed to survive beyond the startup stage since before WW II. Without Elon, most likely Tesla would have gone out of business years ago. At best, it would be struggling along as a small boutique auto maker. Castigating Elon because of his habit of over-reaching, instead of praising him for his many spectacular successes at Tesla and at SpaceX, is pretty small-souled, mean-spirited, and narrow-minded. That’s just Elon but every time ultimately he does deliver. “Too honest” – that’s just silly when someone being too of something good that it becomes bad. Elon Musk is a nice guy, but even myself, a viewer from far, predict better about Tesla than himself. Obviously there will be no model 3 for $35k anytime soon. I thought that was made quite clear, even if Elon never said it explicitly. No question about it. So they’re complaining that Tesla refuses to sell cars at a loss while also complaining that Tesla (according to their false narrative) “isn’t profitable”. But then, neither hypocrisy nor logic ever stopped any serial Tesla basher from posting pravduh, now did it? A Tesla with shorter range, a weaker motor, and no autopilot? That sounds a lot like a Bolt! Supercharging, RWD, attractive exterior…. I can go on and on … oh yeah – not a Chevy/GM product. Well technically, “Funding secured” wasn’t a prediction, so that doesn’t count for accusations of dishonesty. Well – to be fair. He said you can reserve in 2016. And you could. Well the SR should be different. Steel roof, cloth seating, cheaper interior, less sensors.